Love it or hate it but adapt it! It’s no more a matter of your choice now.Timeline cover picture was the latest update that changed how we looked at a brand or a profile. So, we all know how important cover pictures are. When everyone talks about being creative, we care about those who do not think of themselves as creative minds. You have a couple of varying themes, complete choice over background colors and on the top of it scaling and orientation. How else you could think of customizing it? Pic Scatter is just what you are looking for if you like a montage of images in the cover picture space. What I like most about Pic Scatter is that it allows you to pick images from a particular album of yours and your friends. What have you got to say about a cover photo like this? Impressive! Expressive! Customizable! By this time, I feel it should have been on the top of this list. Creating a fun and cool Facebook cover picture for your business or your personal profile could never have been this easy. This picture saved me a lot of words and will save you a lot time. Don’t wait. Go for it! Spice up your Facebook cover picture with a couple of clicks, color and background combinations, and you think you are done! Don’t you? Let’s take you to the world of Canva. I personally have loved the layouts made available at Canva from time to time. Cover Junction has perhaps more than a hundred thousand templates for you and you can easily take them to create mosaics of your most hip hopped pictures and personalize them to the Facebook friendship maps and a lot in between. Face it Pages has a number of tools integrated which enable you to create customized landing tabs for your business Facebook page. On top of it, you can add over 20 apps on your Facebook page, inclusive of custom forms, like-gate etc. FaceCoverz is an easy to use theme-based creation tool. They have more than a hundred thousand templates categorized appropriately to save your time and energy and what I like the most about it is that they update their collection on a daily basis or may even be on an hourly basis, so every time you go back, you will find something new to look at. CoverPhoto Magic is a tool to customize your cover photos. You can create a cover photo, in just two steps. 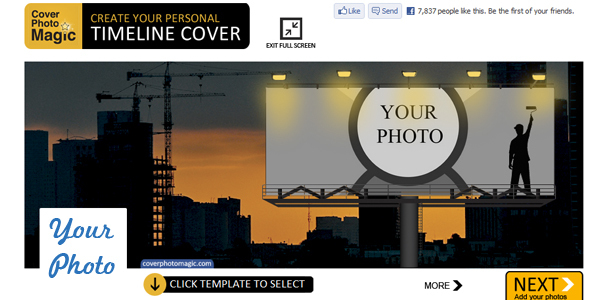 Based on variety of designs, combined with your favorite photos from your Facebook photo albums you can create the perfect cover photo for yourself! Recite is a tool different from all the tools mentioned above. Recite allows you to create your Facebook cover picture with your favorite quote in it. But why this over others to quote my cover picture? On Recite, you just type in your quote, scroll down, select the theme of your choice and Voila! You are done! What’s new about Social Media image maker? You have your cover picture and if you are looking to give it a final touch up with some heads and tweaks, This is just what you would want. This is ridiculously easy to use and results look incredibly fresh and clean. So, this was all about making your Facebook cover picture killer awesome with handy and free tools, all in a couple of minutes!